It's made from mostly thrifted yarn (which I did wash by the way) and my left-over scraps, so it was cheap to make too. copyright Elise Engh: Grow Creative-2014. Please do not copy, distribute, or sell as your own. Notes: This pattern makes a blanket that measures approx. 53 inches wide by 66 inches long. Crochet fewer rows to make a shorter blanket. Row 1: Sc in 2nd ch from hook, sc in same ch, *sc in next 5 ch, skip 2 ch, sc in next 5 ch, 3 sc in next ch; repeat from * across to last ch, end with 2 sc in last ch, turn. Row 2: Ch 1, 2 sc in 1st sc, *sc in next 5 sc, skip 2 sc, sc in next 5 sc, 3 sc in next sc; repeat from *across to last sc, End with 2 sc in last sc, turn. Rows 3-200: Repeat Row 2. Change yarn colors as desired. Download a Printable PDF Version of the Pattern HERE. If you repeat these rows, will the chevron pattern continue through the pattern? 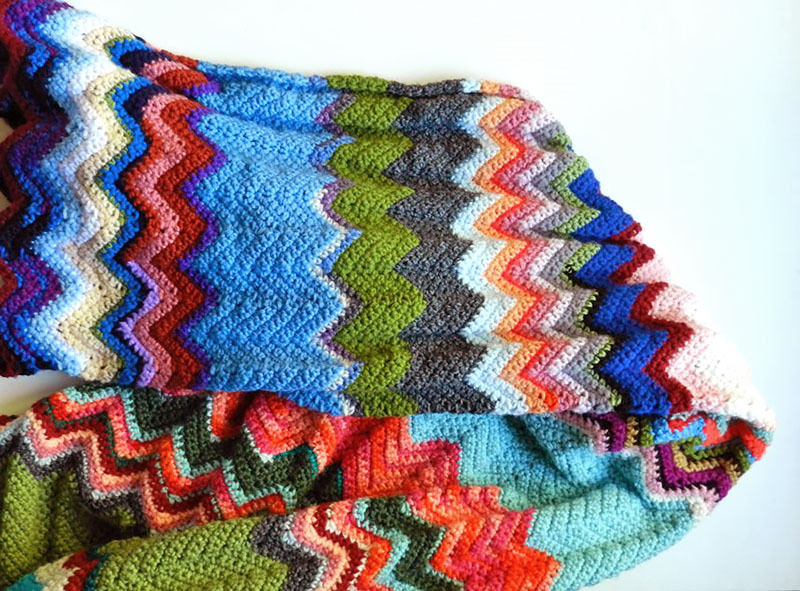 I've tried a couple chevron patterns and always get confused around the third or 4th repeat! Yes, the chevron does continue through all of the rows. Just keep repeating row 2. Hi Elise. I'm coming over from Take a Look Tuesday. I love the Chevron blanket. Can't wait to see what other awesome crochet projects you have. Thanks for sharing. Stunning, I have had to pin this for later as I just have too many half finished things but this is definitely on my "one day " list! Thank you and I hope you get to make this one day. I know what you mean, I have about 3 different projects all going right now. I love your color choices and I love how random it is without a color pattern. Very nice! Pinning this! Thank you so much Kyla! I love it! So simple and so colorful. Linking up tomorrow at Tangled Happy. Thanks for sharing this! 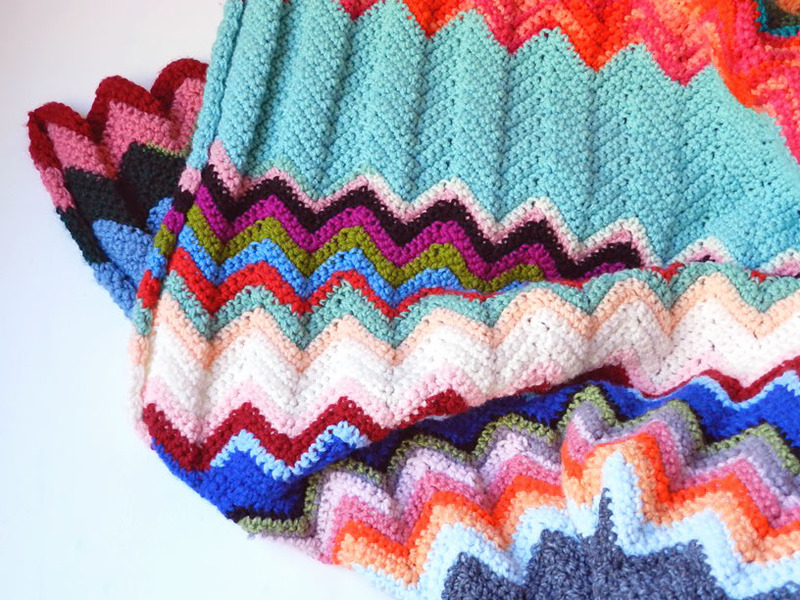 Elise I love your beautiful chevron blanket. I am currently choosing the colors that will look wonderful together. Thank you so very much for sharing your talent and time with us. I am looking forward to getting started and watch the rows grow. Thanks and good luck with you blanket! Thanks for your comments Robin! I can't wait to see your finished blankets! I'm sorry you are having problems with this Taylor. I had trouble the first time I tried this too- it's so easy to loose track of the stitches when there are so many! So my first advice would be to count stitches in the middle. It's easy to add an extra sc in there and then the ends get thrown off. It also could be some confusion with the ends- I think I'll re-write that part of the pattern to be more clear. For the last section, sc in each sc right up the the very last sc. Then put your 2sc in that last sc. So you'll end up with 6sc in the last section. I hope that makes sense! Best of luck to you! 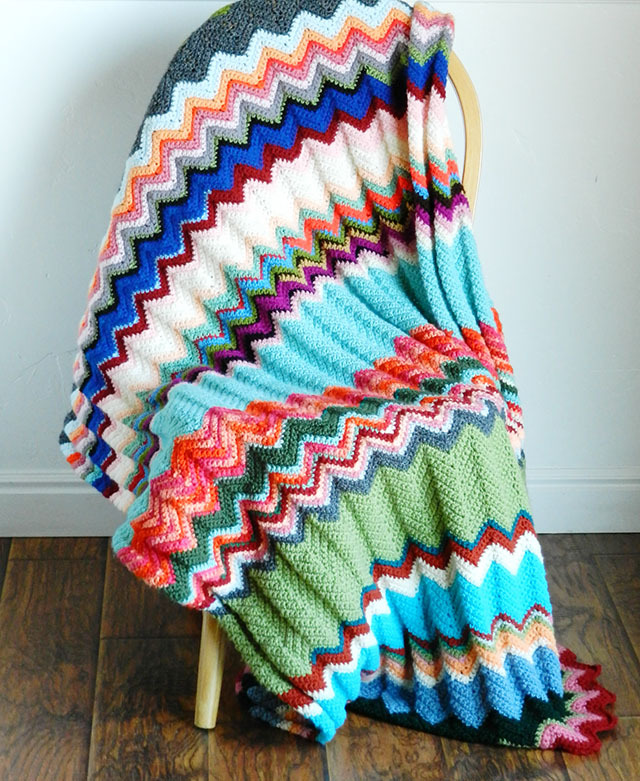 I made this afghan also, however the instructions I got for this same pattern was to make a single crochet in the last sc , make 1 chain stitch and then to turn afghan and start again. Hope this helps. I'm having the same problem. I don't understand why you do two single crochet in the last stitch and again in the first stitch. It throws the whole pattern off. Nancy, I am having the same problem. I have been trying to figure out this stitch for over 10 years now and even with youtube tutorials, the ends increase more and more and the whole thing is wonky. I give up. I have seen this question asked over and over again on various tutorials and nobody seems to have an answer. I have been crocheting for over 35 years and this is the only stitch that I can't do. Unless someone can figure out why the ends of every row increase more and more until you have embarrassing end product, I quit. After searching through many Ravelry patterns I decided to settle on your pattern it is gorgeous, lively and will brighten up any room love your colours. However I will be using only 4 colours mines won't be bright I will be coping your layout for the most part. You did a fantastic job yours is beautiful considering you said you used a lot of scrap yarn. Thank you for sharing. Hi Elise. Thank you for sharing this beautiful pattern. I've started it 3 times and each time, I double and triple check that I'm staying with 236 ch, but each time, the edges are opposite of each other. The left side starts with the chevron angle going up, and I end it with the chevron pattern going down. What could I be doing wrong? That's a tricky problem Janelle! It's hard for me to know where the problem lies when I can't see it for myself. Could you be adding extra stitches in there somewhere? On my blanket, the beginning is angled downward and the end is angled up. I'm having this happen as well. Thanks for your comments Sandy! 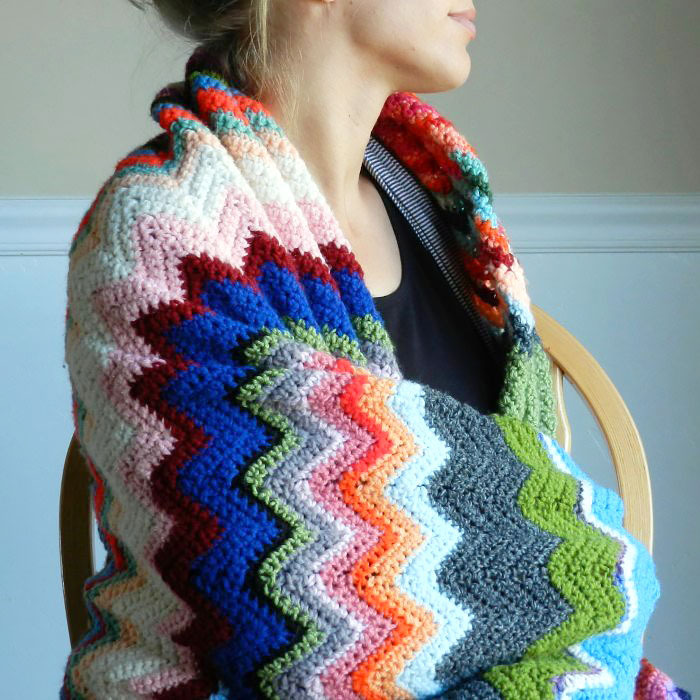 Good look with your ripple blanket- it does sound pretty! I love your afghan! I'm curious, however, as to how you wash your yarn? Or do you wash the finished work? I find a lot of yarn at garage sales for cheap, and sometimes it smells. I washed the yarn beforehand and it was tricky. I found a tutorial where you wrap rubberbands around the yarn and then stick in the washer. I tried that and ended up with a huge tangled mess, but my yarn was clean! I haven't found a great solution for that yet so good luck! I've washed my blanket several times since finishing it and it gets softer everytime. Thank you, Elise. I'm leaning toward washing the finished work after it's complete. I wash it in a nylon stocking after bundling it together. Hope that's helps. Would it still work using the same count but DC instead of SC like the patter on this site for the chevron scarf? I ask because I'm in a DC pattern right now and keep catching myself doing the DC like the scarf ha ha. Carrie- I think this should work with DC, just make sure to ch 2 at the beginning of each row instead of ch 1. I haven't gotten into charts- I read written patterns so much better. good luck. Do you think this pattern would work with Bulky weight yarn (5) ? I haven't tried bulky yarn, but why not? It may make the chevrons more rounded, but other than that I think it will work. good luck! Sweetie blanket! Thank you for the pattern. Do you have a YouTube video of this tutorial? sadly, I have not made any videos for crochet yet. That's a project for the future! Is there any way you could list the names of the colors you used and how many skeins of each. I really like this color scheme. Thanks Elizabeth! I got most of my yarn from the thrift store so I couldn't give you all the names of the colors. I do remember that the the main section of blue and the main section of green were red heart super saver yarn but I don't remember the names of those colors. I'm sorry I couldn't be more specific, but this blanket was really a big combination of scraps so it would be hard to replicate exactly. My advice is to use up your scraps if you have them and buy some other colors that compliment to make up the rest. good luck to you! has anyone made a smaller version of this for a baby blanket? I made a full size and I love it but want to make a baby blanket now, just wondering how many I should make my foundation chain! Thanks! I hope this helps those who can't figure out that extra stitch at the end. It's necessary!!! Is there any way to estimate how much yarn is needed? I won't be using leftover yarn, I will be purchasing a couple of different colors.